In a few short weeks, Reykjavik, Iceland-based death metal squadron, BENEATH, will unleash the hellstorm that is their daunting sophomore full-length, The Barren Throne, once again through Unique Leader Records. With an unrelenting fifty-three minutes of technical death metal cruelty through eleven new tracks, onThe Barren Throne, BENEATH has sought to envelope melody, atmosphere and structure within its manic blastbeats and speed-picked guitars. The album evolves lyrically and conceptually around the idea of a being or entity that consumes and devours everything around it until it’s forced to consume itself. 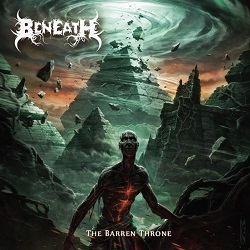 The follow-up to their Unique Leader-released 2012 debut full-length, Enslaved By Fear, the dynamic The Barren Throne is BENEATH‘s first release with new vocalist, Benedikt Natanael Bjarnason, who joined the lineup in June 2013. The album’s massive production was achieved by the Wieslawski brothers of famed Hertz Studios in Poland (Behemoth, Dead Infection, Vader, Decapitated), and the album artwork once again sanctioned to the masterful Raymond Swanland. The end result is a complex and procedural, yet dynamic album that rewards repeated listening. The Barren Throne will be released worldwide on April 29th. Formed in the winter of 2007/2008, the members of BENEATH have all been active in the Icelandic metal scene for some years, with current and former connections to Sororicide, Changer, Atrum, Azoic and Diabolus to name a few. After making their live debut supporting The Black Dahlia Murder in January 2009 and winning the inaugural Icelandic finals for the Wacken Open Air Metal Battle they became the first Icelandic band to perform at the Wacken Open Air festival in August 2009. More festival appearances followed, amongst others Death Feast Open Air in 2010 and Neurotic Deathfest in 2011. In February 2010, BENEATH released their debut Hollow Empty Void EP on Mordbrann Musikk which landed them a record deal with Unique Leader Records. In 2012 the band released their first full-length, Enslaved By Fear, which was mixed by Daniel Bergstrand at Dug Out studios in Uppsala, Sweden.In 2013, singer and founder Gisli Sigmundsson left the band and was replaced by Benedikt Natanael Bjarnason (Azoic).